Please tell us how you felt when it was announced you would be in a new group. Yamaki-chan and I are both in our second year of high school, so we are the oldest in Kenshuusei. Because of that I was very impatient (to join a group) because of my age. So when I was elected to be in a unit, I was at first relieved, and then very happy. Also, Country Musume was about girls from Hokkaido. Since Hokkaido is my birthplace, I was personally very excited about this. Regarding Inaba being from Hokkaido, you have had many fans support you, huh. I have been told that…and that may be true, but moreso, the 12th Generation of Morning Musume was announced, and then the 3rd Generation of S/mileage was announced, they were passing before my eyes and I felt “Aah, This isn’t good,”. Immediately after the announcement my younger brother unusually said “I’ll give you a massage,” So I let him give me one. As he was doing it the light suddenly went out and I heard a “Baan!” noise from a cracker my family set off. At that point I hadn’t made my debut yet, but my family all sang “Happy Birthday Debut to you~”. Everyone was crying, and I said “A. ri. Ga. Touuuu” while crying greatly. It was a very happy surprise. Please tell us about when you entered Kenshuusei. First, I had auditioned for the 9th generation Morning Musume auditions, but after the 3rd round I had failed. After that I felt strongly that I wanted to join Hello! Project, so I decided to audition again for Kenshuusei and passed. Is there a Hello! Project song you especially like? Morning Musume ‘14’s “Toki wo Koe Sora wo Koe”. I was part of Morning Musume ‘14 Concert Tour Haru ~Evolution~ and heard them release it there. The melody is pretty, has a floating feel to it and has an impressive cutting 16-beat feel. It was the first time for being part of a tour, and I thought it was a deep song. 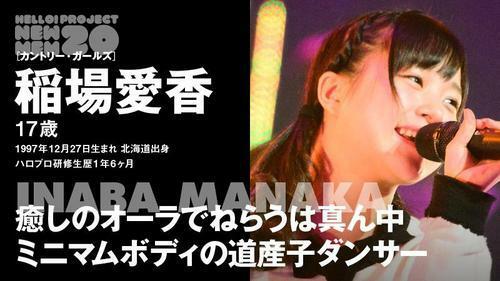 Morning Musume has said it is a difficult song, though. Every time, I would watch them perform it. I would pretend to do it with them. I always danced to it! Is there something you will never forget from your Kenshuusei period? 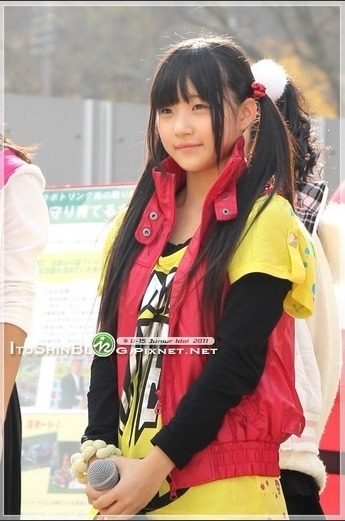 Going on tour with Morning Musume and being a back up dancer for many songs, I have many memories from that time. I was extremely thankful for everything. Every few days there were songs I had to remember; I didn’t sleep much and was very tired. At this Winter Hello! Concert, you had a big feature on Hello! Station. Please tell us how you were center at that time. The teacher taught us the choreography and when it came to decide where we would stand the teacher said “If you think you are good at dancing, raise your hand. Only four of you.” I was worried about it, so I quickly rose my hand. The other people who rose their hand were Shimizu Saki, Sayashi Riho, and Ishida Ayumi. So, I got to stand with them in the formation. There was lot of pressure, right? I didn’t really think I would get the position, so there was a lot of pressure on me. But, I felt that I absolutely had to do my best. If I were to be careless and fail, the entire dance section would be pointless and that would be absolutely terrible. Did you receive encouragement from your senpai? Since a while ago I have liked Sayashi-san’s dancing; I wondered how she could look so cool when dancing. This time I was able to dance near her, and I have studied a lot just from being able to watch her up close. I was also overwhelmed by how beautiful Shimizu-san and Ishida-san danced. They were so beautiful. If I could imitate their small nuances in dancing it would be really nice. Do you think your specialty within the group is dancing? Thats right. Our first song is very cute. The lyrics describe a very cute protagonist and I’d like to try moving spontaneously adorably. Do you have a rival within the group? Shimamura Uta-chan. 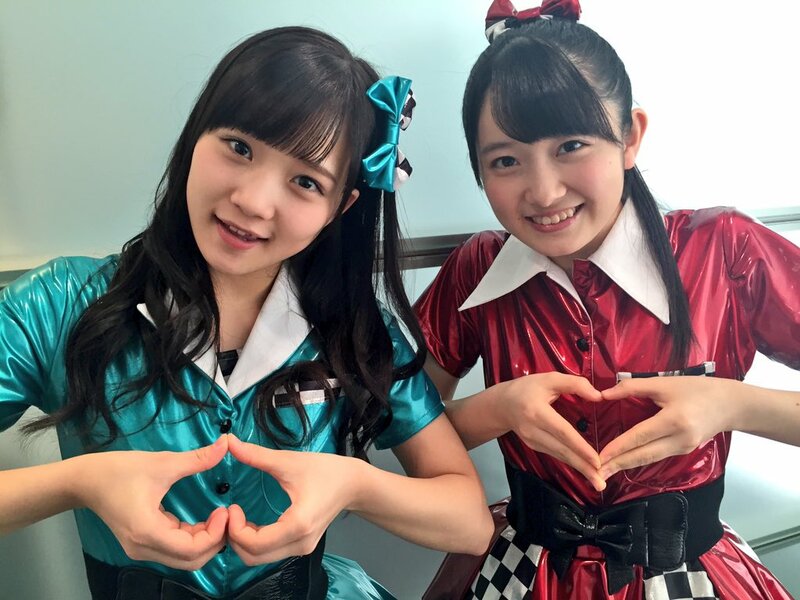 Shimamura-chan is already popular and she has a feel for the stage…I really don’t want to lose to her. Have you noticed any of the other new members in other groups? 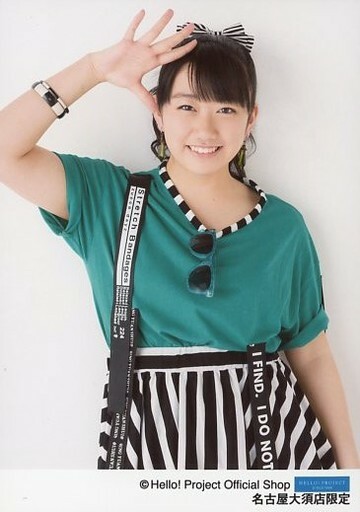 Angerme’s Sasaki Rikako-chan. 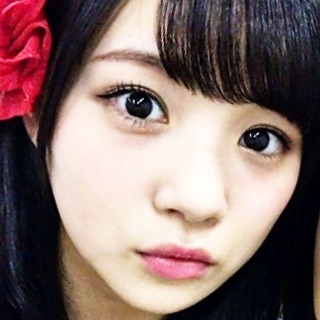 Lately, we have become friends and I love Rikako-chan; when she performs your eyes definitely go to her. I am very small so I have to try my best to make people see me, but Rikako-chan has long limbs, and can powerfully, jump high. I really think she is amazing. I would like people to become interested in our songs and our members. On a whole, I would like everyone to support “Country Girls,”. Lastly, please give your personal appeal. A Hello! Project member’s personality must be cute and have a high level of performance; I really thinks thats amazing. For me, I love dancing and want everyone to get to know me! Please watch over me! Manaka and Mai from Country Girls get their fortunes read by Getters' Iida on an episode of PINKS, which is co-hosted by Miyamoto Karin from Juice=Juice. So in Manaka and Mai Pink!ss appearance that Amped posted, they had a fortune teller guy looking at their horoscopes/personal traits. Manaka: Hard working, doing things quickly if being praised which could mean that her true nature is irresponsible or rough、continually thinking about pervert stuff. Mai: Like to think and reason things out, so she has a tendency to ask things, but she does not like to listen. Her fortune will increase in November this year. Some nice opportunity might come by that time. 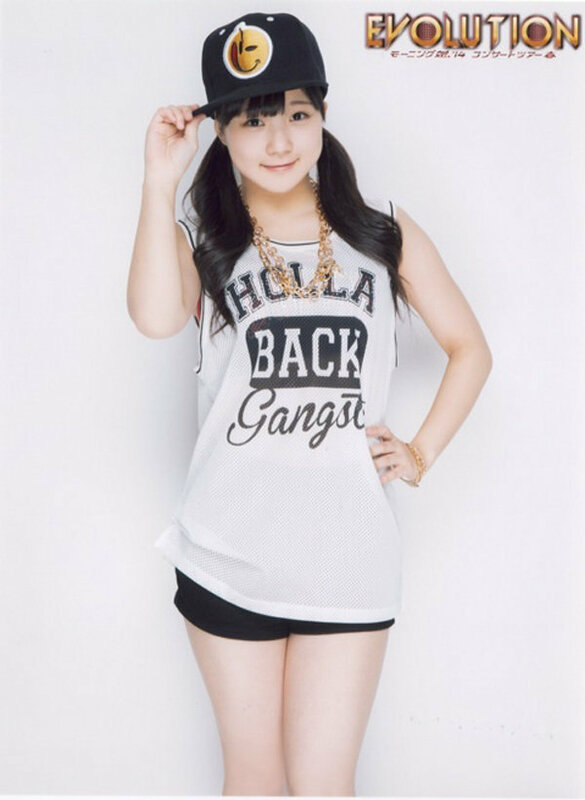 WotaInTranslation - Am I the only one who’s hooked on Manakan aka Inabaccho aka Inaba Manaka-chan? Hey, Country Girl can dance, I can dig that. Full set. Source. She caught my eye during this dance performance (at 22:22, the eventual center girl). Had no idea who she was, but had to find out. Good times. Looking forward to what she has in store for 2016! Okay, technically she's trying to make a peach with her hands, but still a pleasant surprise to see. Between this and her taste in music I can't help but like her even more now. On the flip side, I'm kinda worried about her right now. It seems that she hasn't been blogging much and had to cancel some event appearances due to sickness. I hope there isn't some deeper problem going on. Apparently she's taking a hiatus due to her asthma. I really hope this doesn't turn into a Kanna situation where she decides she likes the hiatus so much that she just quits. Ugh, it's so sad to see her here in the Graduate Plaza already, especially just as I was finally getting a proper appreciation for her. She's still with UFP, though, so I hope she can recover well enough to still do something H!P-related in the future. Perhaps Hokkaido KSS mentor? Or maybe dance duo with Riho? She's officially back on the H!P roster and will be leader of the Hokkaido KSS, with her first comeback performance on September 18! She's also getting her own blog!